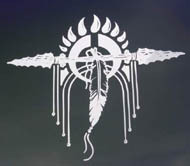 "Display these symbols of Heritage with pride on your auto or home"
Cherokee Trails Trading Post is proud to offer a number of items that are exclusive. These items were either developed by us, or were developed in cooperation with tribel counsels. A portion of the sale of these items goes directly to the support of the related tribes. Contains the Echota Cherokee Logo and the phrase "Reflections of the Past.....Visions of the Future". This phrase denotes that We remember where we came from, that we Honor our Ancestors-and yet that we should always "Keep an Eye to the Future" so that we may continue to strive to grow and better our lives and the lives of our People. This design idea was made possible by Tribal ChairPerson Charlotte Hallmark. PLEASE REMEMBER A PORTION OF ALL SALES THAT CONTAIN THE ECHOTA CHEROKEE LOGO IS DONATED TO THE ECHOTA CHEROKEE TRIBE. Bumper Sticker Larger View Use Your back Button To Return To This Page.